The Marine Installer's Rant: Yacht certified? Whats that mean? Power boats up to 20' in length are legally mandated to have a permanent label indicating maximum horse power, and passenger capacity. Larger recreational vessels, 26' and up typically fall into the "Yacht Certified" category, or not certified at all. The "Yacht Certified" label is bestowed upon a vessel by the NMMA (National Marine Manufacturing Association) because it complies with all applicable ABYC (American Boat and Yacht Council) standards. This is an extensive list, but for vessels over 26' in length, but there are no standards related to capacity or stability, and I asked the NMMA to verify this. The USCG also has a lot regulations regarding passenger capacity, and stability, but recreational vessels over 26' in length are excluded from compliance. It seems to me there is a hole in the system that the 34' Silverton disappeared into. Lets take a quick look at the numbers. 17 adults at 180 lbs equals 3060 lbs. 10 children at 90 lbs equals 900 lbs. 250 lbs of gasoline (full tanks) equals about 1500 lbs. 40 gallons of water (full tank) equal 340 lbs. The holding tank full weighs 150 lbs. The boat's dry weight is 12,500 lbs. If the tanks are full you have 1990 lbs at or near the waterline, and you have movable loads of 3960 lbs. This is where it gets complicated. I think that the movable load, if properly distributed wouldn't have been as dangerous if properly placed. I think that a much smaller movable load improperly placed could be very dangerous. The question is what information does the captain have about the vessels actual passenger capacity, and stability? The answer is all too often close to zero. There are no rules that are usable, other than your instincts. If the tanks near the water line were nearly empty, does that mean you can increase the loads, or decrease the loads? If you have four people sitting on the flybridge, does that change the equation? The owners manual for most vessels is mute on the subject. If you own a Cessna 182 aircraft, the manual tells you exactly what loads have to go where, and how much is load is allowed to insure proper balance and center of gravity in flight. Why is there so little information available to the owner of a powerboat? I'm pretty sure had the captain had some capacity/stability information available about this boat, it would have been followed. Some manufacturers do provide some general guidelines, but a lot don't. In the end, I think manufacturers need to do a far better job of advising boat owners what the weight/load/placement limits are for their vessel. After all they design and build them. I'm not going to be an arm chair captain on what happened in this case. There are way too many variables here that are unknown. Was the boat taking on water? What were the sea conditions at the time? Were the actual loads too great, or in the wrong place? The list is endless, and in the end the experts will figure it out, and we will all learn something from it. But I don't like the fact that for most, there is no information available other than guessing, and this seems to be a shame. The photo I used is mine, and is not the vessel discussed. Has anyone determined if there was a capacity label for the flybridge and if it was exceeded? A much smaller movable load when extended away from the center of gravity will easily roll a vessel, especially if it becomes laterally destabilized (vessel abruptly changes direction, takes a wave abeam, etc.) Our Sea Ray 370 AC has a label that clearly states no more the 850 lbs total (people, gear, etc.) are to be on the flybridge when the vessel is underway. If anything, it seems the USCG should have something on this. This overloading incident sounds like "lack proper vessel knowledge and operating skills" which ABYC and NMMA don't really deal with. Perhaps the "hole" is in the secondary education system. Anyone who completes high school physics should think twice about loading up a 34 foot boat with 27 people. high school ....believe after grade 5 ! Aren't there extensive CFR stability requirements, especially for an upper deck? The last I dealt with commercial construction if you changed a passenger vessel weight by more than %5 it required a new stability report. Move to recreational and all of a sudden the USCG doesn't feel those same standards apply. How does that make sense? I know ABYC is currently working on evolving the standards for capacity & upper decks but not sure what exactly that will mean until we see the standard. My father took 20 of my 7th grade class out on a whale watching field trip 3 miles out from shore in Santa Monica bay. My mother,little brother and a nun came also so 24 total. maybe 3000 lbs. We had six lifejackets (Racing rules requirement)and only three of the girls wore them.Our 36' foot cat was maybe 2/3 the displacement of piture above. No stability issue at all in 2-3 ft waves and everyone could actually have swam to shoe hanging onto our rowboat anyways. Different era 40 years ago(private school also).They were still debating mandatory helmets for motorcycles back then. First major decline in USA cultural attack. I don't ask the Coast Guard the proper way to tie my shoes, wipe my arse, nor design and operate my private yachts. They should get back to life saving and rescue attempts, also smuggler interdiction, and stop adding regulation to write a bunch of tickets over. Why post a picture of a catamaran in the headline? That boat would not capsize with 50 people aboard in calm water shown. This has less to do with a decline in USA "cultural attack" and more of an increase in intelligence since then. Having that many kids on a boat without a life jacket epitomizes the stupidity of your day. The way I see it is one can't legislate stupid. All the government rules in the world won't keep certain people from doing things that most of us wouldn't even dream of. Was alcohol a part of the equation here? 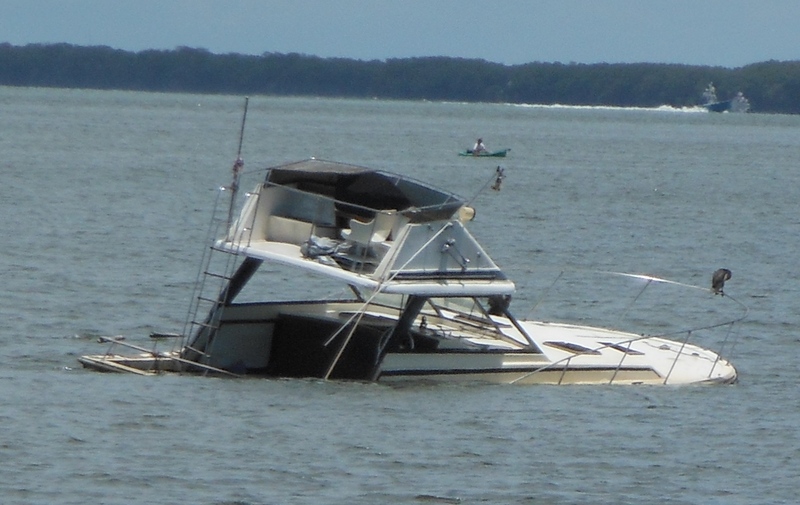 I doubt seriously the guy who put 27 people on his 34 foot boat would of read any manuals. I do not think the Government or the Boat manufacture are to blame. A total lack of common sense Among 27 people are to blame.